First described in 1750, this beautiful large bean is usually purple with mottled black, but can often be lavender. The Scarlet runner, named after its flower, has a long history in Great Britain and other parts of Europe. 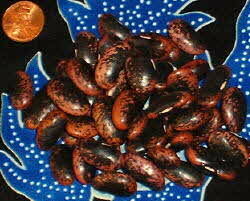 It can be picked young when both pod and beans can be eaten.